To me, a Buddha Bowl is a bowl of balance. This means it contains all of the macro-nutrients (protein, carbs, and fats), and contains many micro-nutrients. There is no wrong way to make a Buddha Bowl! You can grab some protein, carbs, fats, and throw whatever whole foods you love into a bowl and call it a day, or you can craft it super cute for an Instagram pic- it’s up to you! 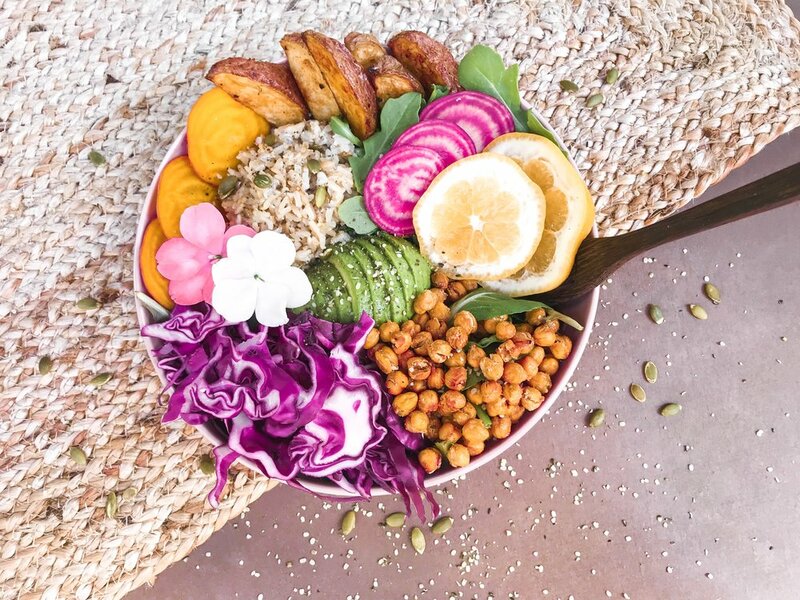 Here’s a step-by-step list of how you can put together a yummy, plant-based Buddha Bowl! Preheat oven on convection to 400 degrees. Pat dry 1 can of chickpeas. Add them to a bowl and mix in 1 tablespoon of oil + garlic salt. Spread out evenly in pan. Cut 3 red potatoes into wedges. Add them to the previously-used bowl and mix in 1 tablespoon of oil + pappy’s seasoning. Spread out evenly in separate pan. Pop both pans in the oven once it has reached 400 degrees. After about 25 minutes, pull out the chickpeas. After about 30 minutes, pull out the potatoes. Cut up veggies. I used arugula, beets, radishes, purple cabbage and spinach. Top with lemon, seeds, and avocado. CHECK OUT MY GUIDES FOR MORE INFORMATION, A GROCERY LIST AND MEAL PLAN! CHECK OUT MY COACHING PROGRAMS!